We did it again! The Mechanism was highlighted as a top New York City Agency of 2018 by Clutch. 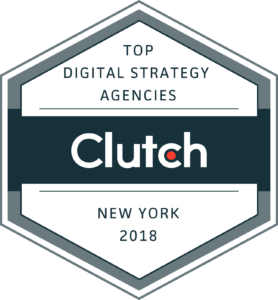 Last week, Clutch published their NYC press release that evaluated the top companies in the digital agency, IT, Marketing, and Development space. We are happy to announce that The Mechanism was showcased in the 11th spot (out of over 400 firms) on their list of top digital strategy companies in New York! Companies are evaluated on their ability to deliver quality services, past and current clients and projects, as well as verified client reference reviews featured on their Clutch profile. The Mechanism's Founder and Design Executive Officer, Dave Fletcher added, "It's fantastic to be featured for a third year in a row on Clutch as a top Digital Agency. The icing on the cake is seeing so many other great colleagues and friends in the digital space being featured as well. I'm thrilled for their accomplishments and successes as well as ours."